Another fantastic round of "AskMe, Name That Book!" Although I cannot remember the title, author/editor, or what the cover looked like at all, I do remember a great deal of detail about what is contained therein. The book I am looking for gave brief, factual descriptions and synopses of the lives of people who were commonly referred to/treated as 'sideshow freaks' in the late 19th/early 20th century, many of whom were also circus performers with P.T. Barnum. Along with The Encyclopedia of Things That Never Were, the book I am trying to find basically defined my childhood, blew the doors off of my already-ridiculous imagination, and led to a lifelong obsession with all things generally considered strange, unusual, morbid, and/or off-putting (think: I want to get married at the Mutter Museum). It took what many would consider an odd, uncomfortable, or even humorous subject and treated it with total respect. The book is not directly related to Tod Browning's 1932 movie Freaks, but it does feature many of the same people. * Not a short book at all, maybe 150-200 pages, plus photos? * Divided into chapters based on the "type" of "freak" -- unusually hairy people, unusually tall/short people, etc. It's been driving me mad for decades that I remember an incredible amount of detail from the book's contents -- like the story of Chang and Eng doing tumbling exercises to lengthen the band of increasingly elastic connective tissue that conjoined them, and the aforementioned Irish Giant tale -- but not the title. All of my searches over the intervening decades have been fruitless. I would just love to track down a copy and re-experience the greatness once more. Anyone who is able to identify this book with these vague details gets my eternal love and devotion. Thank you! Yep, it looks like the original for that book was published in 1976 -- as such, particularly when reading the reviews, I really thought it would be The One, but the title just wasn't clicking for me, as I knew it had been something rather unique (which is such a vague descriptor that I didn't even bother mentioning it in the question). However, looking through Amazon's 'Customers Who Viewed This Item Also Viewed' section for Freaks: We Who Are Not As Others led me to the real answer! 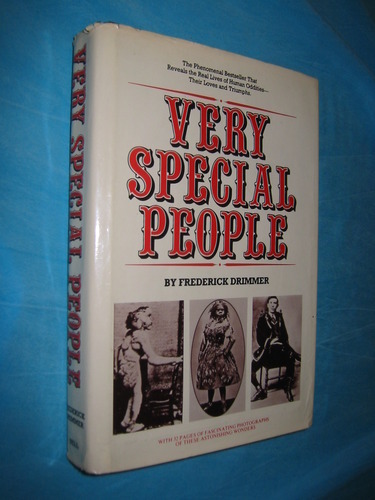 The book is Very Special People by Frederick Drimmer, originally published in 1973. I recognized the cover immediately. I cannot really comprehend that after all of these years of fruitless searching, it's just right there, right now, and I can buy it for one penny! Yay internet! Bonus, from one of the Amazon reviews of Very Special People: "I would not recommend it to the very young and/or impressionable, as it could be haunting..."
Thank you so much, scody. I would not have found this without your answer and the book you linked is going on my to-read list, for sure. Victorian Grotesque is a similar book I remember poring over as a kid, but I see that's going for megabucks on Amazon now. Also possibly of interest: Learned Pigs and Fireproof Women (previously) by Ricky Jay (more previously). The wonderful scody is indeed worthy of your eternal love and devotion. To follow up on the OP, I have since discovered that there are actually two men who were both colloquially known as Irish Giant; the rather horrifying anecdote I was originally thinking of involved Charles Byrne the Irish Giant, not Patrick Cotter O'Brien the Irish Giant.